I currently manufacture enclosures and dust covers for a number of products within the Elecraft product line. I fabricate these products from two basic types of plastics: polycarbonate and acrylic. 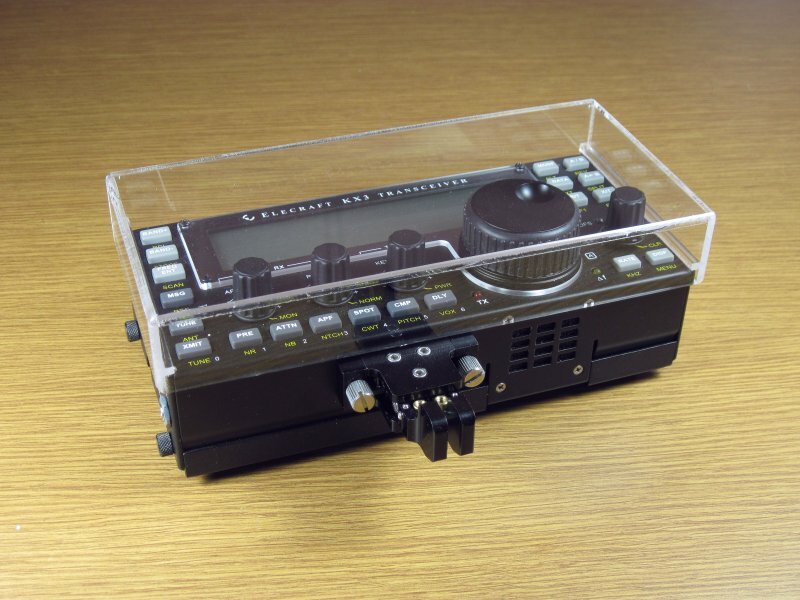 For Elecraft's mini-module kit line, polycarbonate is used. It is very strong and is up to 250x stronger than glass. Since the design goal was to protect these modules when used in the field, polycarbonate was the optimum choice. The polycarbonate sheets I purchase also incorporate a UV blocking mechanism mixed into the final product. Although it can scratch easier than acrylic, the hardness of polycarbonate makes it very suitable for portable field use and the potential for dropping or falling onto hard surfaces. Each enclosure is hand cut on my table saw from 0.093" thick polycarbonate sheet. This thickness is thin enough to make the enclosure light weight yet strong enough to protect the module. All efforts have been taken to externalize ports and power connectors where appropriate to make connections to and operation of the module simple and effective in the field or on the bench. This simple dust cover for the KX3 and PX3 is made from clear 1/8" thick cast acrylic. Although perfectly acceptable for use in the field, this cover possess a glass like appearance to show off the good looks of the KX3 or PX3. The cover sits on the face of the KX3/PX3 and overlaps the sides 1/4". This allows the cover to be used with or without the accessory cables and paddles connected to the unit. Each cover is hand cut on my table saw and welded with the protective covering left on to prevent any damage to the surfaces. The edges are then routed with a 1/8" round over bit to provide a nice smooth feel with no rough edges. The protective covering is then removed just prior to shipment and the cover is polished with a static free cleaner prior to packaging. Covers are currently offered in clear or black opaque acrylic.